Perfect for the fashionable 'no socks' summer look, yet made to the same high standards as the brand’s ‘to be seen’ socks, Pantherella Sienna Striped Egyptian Cotton Footlet Socks are designed to be hidden perfectly underneath deck shoes, loafers, espadrilles and even trainers for the ultimate in comfort. 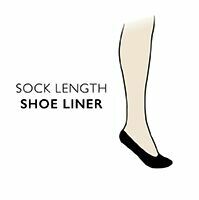 Made in England, from Egyptian cotton-rich yarn and designed with Pantherella's signature attention to detail, Pantherella Sienna Striped Egyptian Cotton Footlet Socks are breathable, with tops cut to sit 'invisibly' below the shoe-line, ‘seamless hand linking’ and non-slip heel grips. An applied antibacterial finish ensures fresher feet for longer.